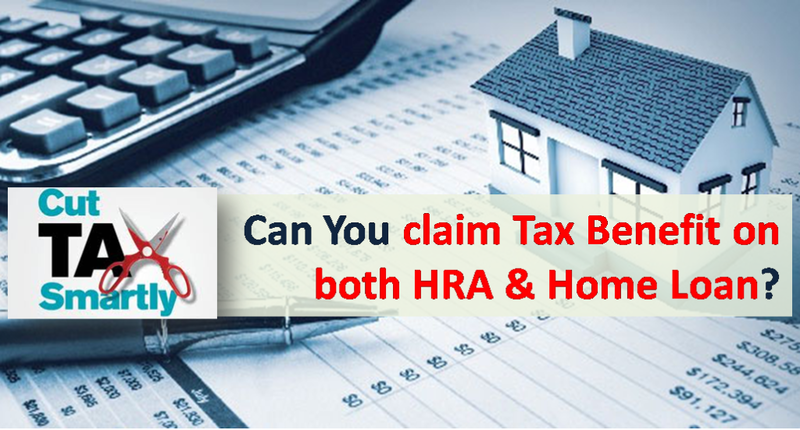 Can I claim Tax Benefit for both HRA & Home Loan? – A question which is often asked by many tax payers. This is mainly because many employers do not allow both tax benefits together in certain situations. Unfortunately this is NOT the right thing to do. Both HRA and Home Loan Interest tax sections are unrelated. You claim tax benefit on HRA (House Rent Allowance) under section 10(13A) while the tax benefit on payment of interest on home loan comes under section 24(b). However there can be issues if both the sections are used together with the intent of tax evasion. We can have four situations for people claiming HRA & Home Loan tax benefit. We cover each situation one by one. This is a very easy situation to handle. You can easily claim tax benefit on both and NO employer has issue with this arrangement. Also Read: How to Generate Rent Receipts Online? This is tricky situation. The first logical question which comes to mind is why would any person owning house in the same city stay on rent? Most employers have issue with this arrangement and may not give tax benefit on both HRA & Home Loan. But legally you can claim tax benefit on both if you can give a valid reason for this arrangement. The reasons can be its more convenient to stay. For e.g. your flat is on the outskirts with almost negligible public transport, you might not want to live there and rather stay close to your place of employment. The other reason could be the owned house is smaller for the size of family.There are misconceptions that there should be minimum distance between two houses. All this is myth! All you need a genuine reason to stay on rent. Also if you move to your new owned house in the middle of financial year, its a genuine thing to do and you can claim HRA for the period you stayed on rent and house loan benefit for the entire year. In case your employer is not ready to give tax benefit on both – you can claim HRA tax benefit from employer and claim tax benefit on Home Loan while filing your Income Tax return. The other question is should the owned house be assumed to have notional rent? The answer is No. If you receive actual rent then show, only then you need to pay tax on that. Actually pay the rent through Cheque/ECS etc. and receiver should give rent receipt for the same. The landlord/lady should show this rent as “income from house property” and pay taxes on the same. There have been cases where rent paid to close relatives have been denied tax benefit by income tax department as there was NO evidence of actual transaction. So stay careful. There may be case where you have rented a place where your spouse/parents stay (in a different city) while you own a house at the city of your employment and stay there. In this case you cannot claim HRA tax benefit as HRA is paid for staying on rent for purpose of employment. However you can easily claim home loan tax benefit. Can you Claim Tax Benefit on both HRA and Home Loan? I hope this might have clarified the question of availing tax benefit on both HRA and home loan. I am resident of a Metro. I have a flat which is 15 years old and i completed the loan repayment. I stay in the same city but different place in a rented accommodation. I bought a 2nd house (under construction) from nearby district, which will not form part of the metro, for which i availed loan facility from nationalised bank and i am payment monthly EMI. Kindly clarify whether i will be eligible to claim HRA and 2nd loan facility EMI in my Income Tax. I leave in rented house. I have purchased flat which is under construction. Paid 90 percent of payment towards flat. In this case Can I claim both concessions? I own a house in a nearby city which is away from my work place. Earlier I was staying there but due to long distance I have started living in rented house nearby work place (Rent Paid: 8K per month). I have rented out my own house and getting rent 4K Per month as it is in remote place. Now, how can I claim this rent paid? Also I believe I will have to show the rent received as income. What are declarations and documents do I need to furnish. My company does not consider PG stay for HRA claim. Also it doesn’t allow if Rental Agreement is not given where rent paid is greater than 1lakh a year, are these valid point to disallow HRA claim? And can employees claim HRA while filing returns rather fighting with HR dept? There are no fixed guidelines by IT department on what documents should employer ask from employees, but the onus is on employer to verify the proof employee is submitting. Hence some companies are extra cautious and ask for additional documents. In case your employer does not agree you can still claim HRA while filing your tax return.